A deus ex machina is a plot device whereby an unsolvable conflict or point of tension is suddenly resolved by the unexpected appearance of an implausible character, object, action, ability, or event. For example, if a character fell off a cliff and a flying robot suddenly appeared out of nowhere to catch them, that would be a deus ex machina. The goal of this device is to bring about resolution, but it can also introduce comedic relief, disentangle a plot, or surprise an audience. Usually, but not always, a deus ex machina introduces a "happy ending" or peaceful resolution. Generally speaking, deus ex machina is regarded as an easy—and therefore somewhat cheap—device for bringing about resolution in a plot. It can make the plot seem weak, sloppy, or ill-conceived. Deus ex machina is a Latin term, borrowed from a Greek phrase meaning "god from the machine." The origin of the term comes from the crane (mechane) that was used in ancient Greek drama to lower the actors playing gods onto the stage at the end of a play. When a writer uses deus ex machina, the story's resolution comes from the unexpected introduction of a brand new element, rather than from the facts and circumstances that have already been established. Because of this, use of the device is controversial. Some people think that deus ex machina is always evidence of authorial laziness, or that its use should be strictly avoided because deus ex machina makes a story feel hokey or contrived. Others, however, argue that, while deus ex machina can certainly be used badly, there are some circumstances in which the use of the device is appropriate. Below, we give a brief overview of both points of view. That deus ex machina is evidence of a weak plot: Aristotle espoused this view in his philosophical treatise, Poetics. He argued that the resolution of any conflict should arise internally, from the action, objects, and events that have already been introduced in a story. In other words, Aristotle and many others argue that if a plot were coherent, then its conflicts would be resolvable within the circumstances that the writer has already established. Thus, only a lazy writer would write a plot with a deus ex machina resolution. That deus ex machina distorts the messiness of reality: Many people argue that, since deus ex machina is so often used to resolve an unresolvable situation, its use tends to oversimplify the world, particularly with the aim of presenting false optimism or an easy moral lesson. Thus, deus ex machina is strongly associated with simplistic or didactic storytelling. Towards the end of the 19th century, Friedrich Nietzsche made this argument in his criticism of the ancient Greek playwright Euripides. Nietzsche argued that Euripides's reliance on deus ex machina made his tragedies falsely optimistic. Instead of allowing the world to be messy and unresolvable, Euripides's dramas often used deus ex machina to force situations into improbably tidy resolutions. Thus, opponents of deus ex machina often argue against its use because they prefer artworks to acknowledge that, in real life, not all loose ends can be neatly or perfectly resolved. While deus ex machina carries an unequivocally negative connotation for many people, others argue that the device can be used in situations in which the author has carefully considered its effect. Not everyone will agree on when deus ex machina is appropriate and when it isn't; examples that some people consider to be thoughtful and deliberate, others believe to be lazy and absurd. But it's important to note that people often argue in favor of the device. Here are two examples of instances in which the use of deus ex machina is arguably both deliberate and appropriate. This is not a plot-driven story. Lord of the Flies derives its power from its exploration of the human psyche, rather than from the intricacies of its plot. Because of this, Golding's use of deus ex machina does not undercut the thematic content of his book. In other words, the deus ex machina (the naval officer) improbably saving the protagonist is surprising, but this event does not present a false resolution to the troubling events that previously occurred. Regardless of whether the protagonist had lived or died, readers have, by the end of the book, already experienced the psychological unraveling of the boys and witnessed their propensity towards violence, which is what led to the protagonist's dire situation in the first place. Thus, despite Golding's use of deus ex machina, the book still retains its pessimism and moral complexity. In fact, some argue, the arrival of a military officer who represents civilization actually underscores how the boys descent into violence is in fact universal—this man who appears and thinks the boys are just playing at being savages, and who thinks of himself as civilized, is a part of a war that is far more violent and destructive that the boy's actions. So the appearance of the officer might be a deus ex machina in terms of plot, but it fits in well with the larger themes of the text. The deus ex machina is surprising, but not implausible or utterly unforeseen. William Golding does not mention the approach of the naval ship, nor do the boys expect the arrival of the naval officer. However, the author does intersperse some subtle foreshadowing that a ship could come to their rescue. At the beginning of the book, the boys build a signal fire on the island so that passers-by would know that they were stranded. This establishes that, within the world of the book, a ship might find the boys. At one point, in fact, the boys watch a ship pass, though their signal fire is out, so the ship doesn't stop for them. Deus ex machina purists might argue that Golding's foreshadowing means that the naval officer is not, in fact, a true deus ex machina. However, the officer's surprise arrival to rescue the protagonist at the last possible moment from imminent doom makes for a strong argument that this is an example of the device, albeit one that was deliberately considered and carefully set-up. A deus ex machina can also be used to intentionally disrupt an audience's sense of what's fiction and what's reality, or to parody the conventions of a genre in which implausible resolutions are the norm. One such genre is superhero movies—a fact of which the creators of the 1966 film Batman seemed well aware. The film parodies the deus ex machina device by showing Batman overusing his conspicuously convenient gadgets to the extent that they begin to seem absurd. For example, in one scene Batman is being attacked by a shark and he calls for Robin to bring him his handy shark repellent, which makes the shark explode. It's a hopeless situation, and without some incredible intervention—like the sudden appearance of heretofore unmentioned shark repellent—Batman would not have been able to survive. Thus, this self-aware use of deus ex machina is defensible in that it's used to parody the lazy plots of other superhero movies. In sum, there's no easy answer to whether deus ex machina is a scourge on storytelling, or a device that (while perhaps often abused) can be used to powerful effect. Regardless of your personal opinion on the device, though, it's helpful to know that no single opinion is definitive or "correct." The rule of thumb for plot twists in literature is that a reader should be surprised, but shouldn't say, "I don't believe it." According to convention, the action and characters should make the story's world feel completely real. Even so, some books—even highly-acclaimed novels—break free of that expectation for a specific effect. Philip Roth's novel The Plot Against America imagines what would have happened if Franklin D. Roosevelt had lost the 1940 American presidential election to Charles Lindbergh. In the world of the novel, antisemitism becomes more accepted after Lindbergh's election and Jewish families like Roth's are persecuted. The state of Jewish oppression escalates and, as a result, many Americans live in fear. However, instead of imagining a Lindbergh presidency continuing into utter catastrophe, Roth writes a deus ex machina in which Lindbergh's plane goes missing, and former president Roosevelt runs again as an emergency presidential candidate. While this sudden turn of events helps the novel to realign with the actual facts of history (Roosevelt as the President) and resolves the novel's many imminent catastrophes, it isn't necessarily a happy ending. Though he uses a deus ex machina resolution, Roth has already shown readers how quickly and frighteningly American politics can turn toward evil. Roosevelt, then, comes across as a temporary solution to a lurking problem, allowing the book's ending to remain foreboding. Deus Ex Machina in Edgar Allan Poe's "The Pit and the Pendulum"
Poe opens his short story, "The Pit and the Pendulum," with an unnamed narrator condemned of committing heresy against the Catholic Church, and then imprisoned and put through terrible psychological and physical torture by shadowy representatives of the Spanish Inquisition. Just as it seems that his death is imminent, though, a French general, who has seized the prison from the Spanish, saves him. This abrupt aid allows the narrator to live and tell the story, so Poe's deus ex machina resolution is a necessary narrative trick. In addition, it has thematic resonance: the protagonist is propelled by reason, not faith, and he ultimately isn't saved by someone from the Church, but rather by an outsider. Thus, the deus ex machina in this story—though it evokes divine intervention—suggests that reason, not belief in God or the Church, is man's only true salvation. Deus ex machina appears often in ancient Greek plays. Its most notable user was Euripides, who most scholars believe pioneered the device. For the Greeks, deus ex machina was not an easy solution to a plot problem, nor an attempt to surprise and entertain the audience; deus ex machina, to Greek playwrights, was a device useful for imparting moral lessons. While contemporary readers might not find the resolutions to certain Greek plays "realistic," these endings were intended to suggest divine criticism, approval, or insight into mankind's actions. In other words, the plays were not supposed to be merely entertainment or a perfect reflection of human reality—they were also religious or moral commentaries in which the gods intervened at the end to teach humans a lesson. Here are a few examples of deus ex machina in ancient Greek drama. The Oresteia is a trilogy of plays by Aeschylus that tell the story of the cursed House of Atreus, a royal family marred by its long and convoluted history of internal betrayals and honor killings. In the final play of the trilogy, the protagonist—who has just murdered his mother in revenge for a murder she had previously committed—is about to become the victim of yet another familial honor killing himself. Instead, the god Apollo arrives to save him, declaring an end to the generations-long bloodbath that has plagued the family. Apollo announces that the family drama will be resolved through a trial by jury—the first of its kind—and the god's intervention thereby abolishes a tribalistic concept of justice (based on honor and revenge) and establishes instead a concept of justice based on reason and evidence. The arrival of Apollo is a deus ex machina, but it serves a critical function in drawing together the themes of the three plays into one very clear moral principle. Medea tells the story of a woman who is determined to take revenge on her unfaithful husband. To inflict maximum pain, Medea murders the children she and her husband had together, as well as her husband's new fiancée. As soon as Medea's husband discovers what she has done, a golden chariot appears, and she rides away with the corpses of her children. When it was originally performed, the chariot—the play's deus ex machina—was lowered onto the stage using the crane typically reserved for the entrances of gods and goddesses. Thus, instead of using the ending to punish Medea for her crimes (as other ancient Greek plays might have), Euripides uses a deus ex machina to make her seem divine. Many critics read this sympathetic deus ex machina resolution as a feminist examination of being a woman in a patriarchal society. As Deus ex machina is an improbable solution to an thorny problem, the device is commonly found in films that already have a fantasy element, such as superhero films. However, deus ex machina can be found in all types of film. A classic example of deus ex machina is the "it was all a dream" ending, wherein a writer reveals at the end of a narrative that the events didn't actually take place—or at least not quite as they were described. After Dorothy's adventures in The Wizard of Oz, she wakes up in her bed at home. Although she insists her adventures are real, her family says she hit her head and it was all a dream. Even though the film was fantastical—with talking lions and scarecrows—it was otherwise consistent, so this rather ordinary explanation feels completely unexpected. While this is a widely-celebrated film, many critics say that the ending feels gimmicky. You can watch the ending here. Animated shows and films often use deus ex machina for a comedic effect. In The Emperor's New Groove, the protagonists are being chased by the antagonists across a mountain. Just as the protagonists seem as though they will be overtaken, the antagonists are struck by lightning and fall off a cliff. It's entirely implausible that a lightning bolt would strike these pursuers on an otherwise sunny day, but it's the moment's ridiculousness that makes it funny. You can watch the scene here. What's the Function of Deus Ex Machina in Literature? Deus ex machina can be surprising and exciting for readers or audiences, since shocking endings can make for compelling narratives. When a writer finds him or herself with no other option for moving a plot toward a resolution, deus ex machina can be used (though such usage of deus ex machina is usually seen as lazy writing). If a writer wants to change the arc of a story so it doesn't reach a point of crisis that seems inevitable, a deus ex machina can be introduced to save the day. Because deus ex machina is often criticized, it can be a great and subversive tool for undercutting literary conventions and expectations. In this way, it can open up new artistic possibilities. The Dictionary Definition of Deus Ex Machina: A basic definition of the term, including etymology. The Wikipedia Page for Deus Ex Machina: A useful guide to the term's origins, but can become a bit technical. The Theatre Dictionary Example of Deus Ex Machina: This short skit illustrates the surprise resolutions of deus ex machina. 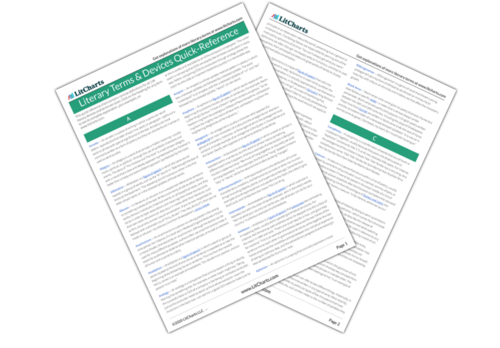 Get a quick-reference PDF with concise definitions of all 136 Lit Terms we cover. Hogue, Chelsea. "Deus Ex Machina." LitCharts. LitCharts LLC, 5 May 2017. Web. 19 Apr 2019. Hogue, Chelsea. "Deus Ex Machina." LitCharts LLC, May 5, 2017. Retrieved April 19, 2019. https://www.litcharts.com/literary-devices-and-terms/deus-ex-machina.